e) the offset or angular misalignments exceed any fabrication tolerances specified as being consistent with the design Aa-N curves used in the nominal stress approach. (2) For tubular nodal joints the hot spot stress range should be evaluated at sufficient locations to characterise fully the fatigue performance of each joint. For example, in the case of a tubular set-on connection at least four equally spaced points around the joint periphery will need to be considered. For any particular type of loading, e.g. 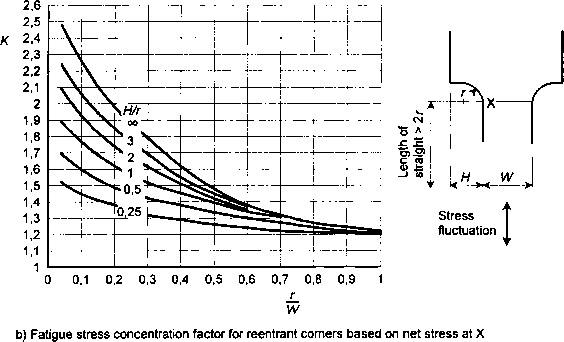 axial loading this hot spot stress range is the product of the nominal stress range in the brace and the appropriate stress concentration factor (SCF). (3) The hot spot stress is defined as the greatest value of the direct stress around the brace/chord intersection of the extrapolation to the weld toe of the geometric stress distribution near the weld toe. This hot spot stress incorporates the effects of overall joint geometiy, i.e. the relative sizes of brace and chord, but omits the stress concentrating influence of the weld itself, which results in a local stress distribution (see Figure A.3.1). (4) The calculation of hot spot stress may be undertaken in a variety of ways e.g. by physical model studies, finite element analysis, or by use of semi-empirical parametric formulae. The position of the 'hot spot1 in relation to the crown and saddle can be determined by the first two methods but not in all cases by parametric equations. When physical models are used, care should be taken in obtaining the geometric stress extrapolated to the weld toe as described above. When finite element calculations do not allow for any effect of weld geometry, the hot spot stress at the weld toe can be estimated from the value obtained at the brace/chord intersection. Parametric formulae should be used with caution in view of their inherent limitations; in particular they should only be used within the bounds of applicability relevant to the formula under consideration.